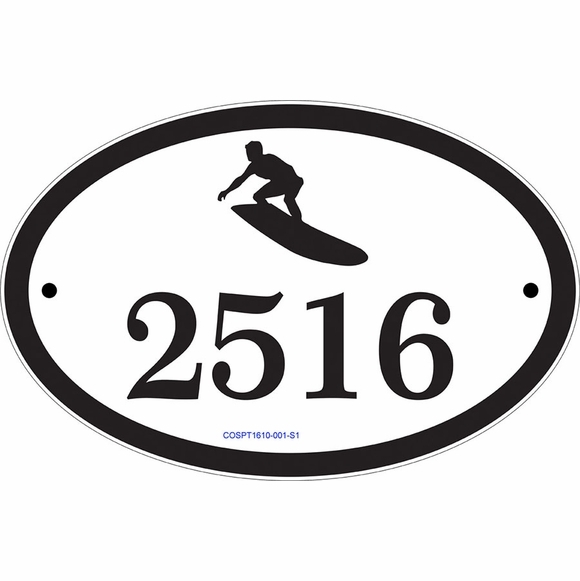 Extreme Sport Theme House Number Plaque - - for the avid sportsperson. Sport themed custom made residential address sign. Personalized with a logo of your extreme sport above the large house number. Wall mount. Made in the USA. Specifically designed for surfers, snow skiers, water skiers, skateboarders, and fans of other extreme type sports such as go carting, snowmobiling, trick cycling, ATVing, hang gliding, parachuting, and free falling. The sport image you select is at the top of the sign. House number line holds up to four (4) 3.5" or five (5) 3" characters. Note: the style number in the lower center on the sample signs is for internal use only and is not engraved into your custom sign. Please allow 1 to2 weeks for delivery. Personalized address sign custom made for the extreme type sports fan, including surfing, skate boarding, go carting, water skiing, snow skiing, snowboarding, snowmobiling, trick cycling, ATVing, hang gliding, parachuting, and free falling.